The Ducor Hotel – on our first day in Monrovia, we visited the Ducor Hotel. Once one of West Africa’s finest luxury hotels, it had been abandoned during Liberia’s civil war. We had the opportunity to explore it and climb to the top. Wandering around the hotel was eerie and dark (no electricity). And we had to make sure to watch our step – there were many holes in the floors and unstable spots, none of which were marked. We also saw plenty of graffiti in the rooms. At the top, we climbed out of a small window right near the edge of the building (no railing!) to get to the roof. From there we could see the whole city and a view of the Atlantic Ocean! 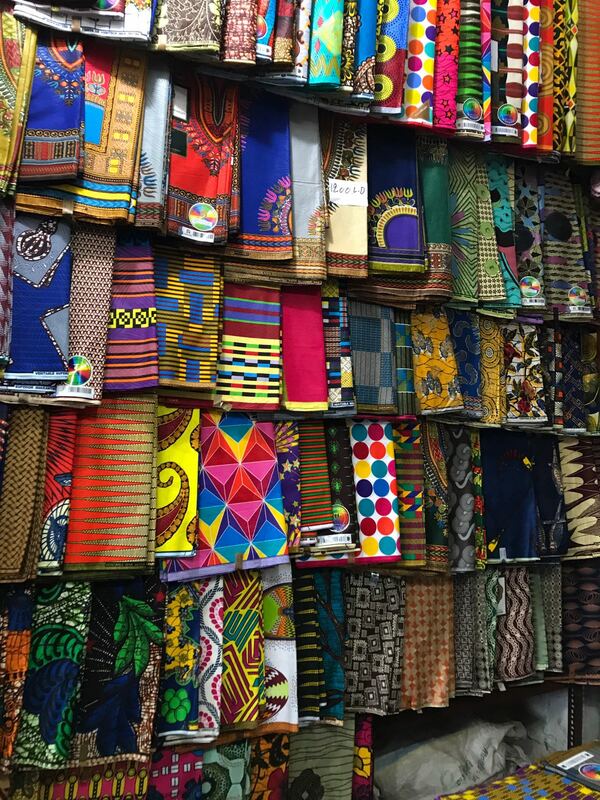 Waterside Market – since arriving in Liberia, we’ve asked many many questions about if we are able to get this or that here, and the most common answer is “you could probably find it in Monrovia.” We finally got to see the market that we’d been hearing about! 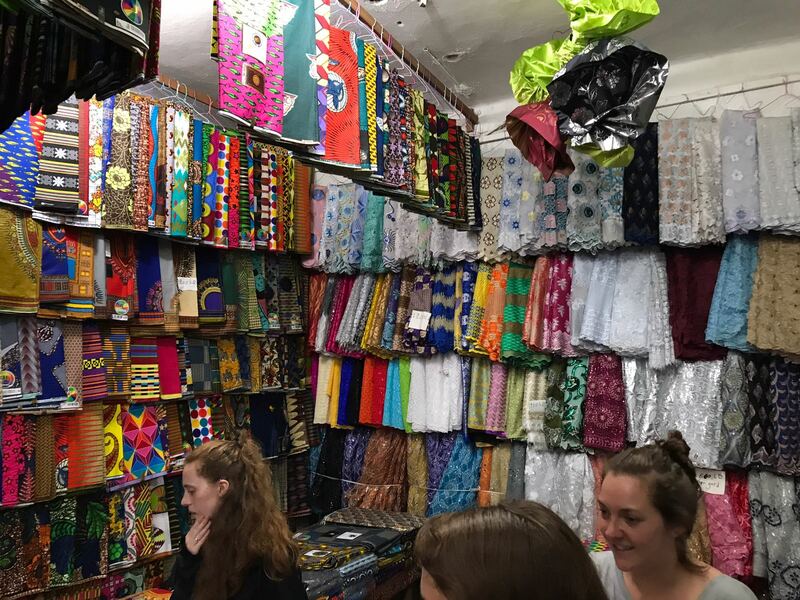 Unfortunately, it was raining the second day so we didn’t end up exploring as much as we would have liked, but I did buy some lappa (colorful African fabric) and we got to check out the supermarket where we’ll have the best chance of finding things from home. So many lappa to choose from! The American Food – one of the highlights on the trip was all of the food we could get in Monrovia! I had pizza (twice! ), a cheeseburger, chicken fingers, pad thai, donuts and fancy coffee drinks to name a few – all things that I hadn’t had in the 5 weeks since arriving in Liberia! While it was definitely nice to have some comfort foods from home, it’s something that will be hard to do often because it was pretty expensive compared to the Liberian foods we’ve been eating in Kakata. 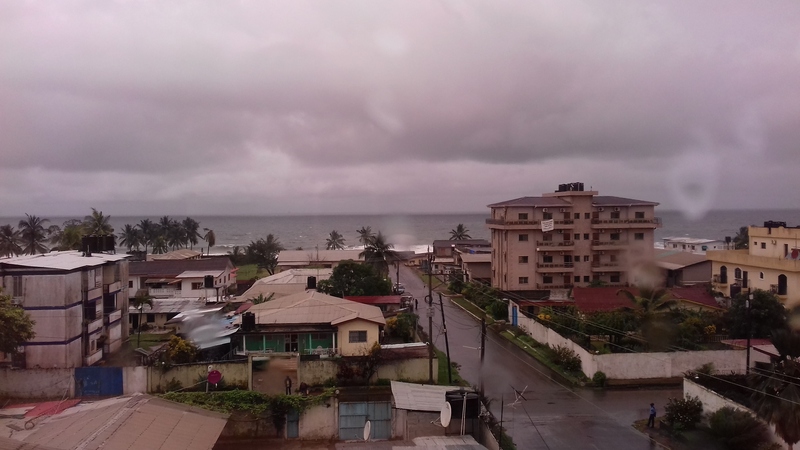 Dipping my toes in the other side of the Atlantic Ocean – Monrovia is on the coast, the ocean was just a few blocks from the Peace Corps office! We also went to a bar on the beach one of the nights we were in town. Navigating the taxi system – one of the most important parts of the trip was learning about the local taxi system. We learned the difference between chartering a car (calling a driver and paying for the whole car) and flagging a car down on the street (where you will likely pile in with 5 other strangers). We also learned the many different hand signals to use when flagging a car, as it will vary depending on where you are going. And finally, we had to find our way around Red Light parking in order to get home to Kakata. Red Light is one of a few “parkings” on the outskirts of town, where you are able to get a taxi to travel to another city (the parking you want depends on where you are trying to go – for the site visit a few weeks ago, we left from a different parking). Four of us traveled together, chartering our own car to get to Red Light (which is much more expensive than flagging down a car, but we didn’t want to get separated!) and then finding a taxi once we got there. The traffic was crazy – what was maybe a 10 mile drive took more than an hour! But our driver had sent someone ahead (he could walk faster than we could drive) to get a car to Kakata for us. But we had to be clear that we did not want to charter the car, so the 4 of us piled in the back and a Liberian man sat in the front passenger seat. The car is not full until there are 4 passengers in the back and 2 in the front. So throughout the drive home, whenever we’d pass a town our driver would slow down, honk his horn and hold 1 finger out the window, signaling that there was one seat available and eventually we picked up another passenger. We made it back to Kakata safe and sound! This entry was posted in Africa, Liberia, Peace Corps and tagged Ducor Hotel, Lappa, Liberia, Monrovia, Peace Corps, Peace Corps Liberia, Waterside Market. Bookmark the permalink.